Create your Best Sun Peaks Vacation memories with these preferred Sun Peaks Services and Providers. 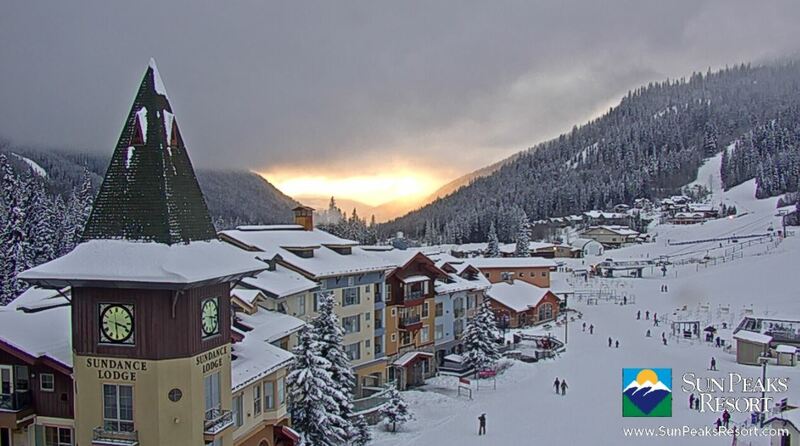 No matter the season, Sun Peaks Resort has something happening and it is always a wonderful time to head up the hill. And whether you are staying at our Best Sun Peaks condo, luxurious Trapper's Landing townhouse, or at another form of Sun Peaks accommodation, you can customize your holiday any way you choose. Would a single or couples massage right in your accommodation or at the Sun Peaks Spa help you relax or celebrate a special occasion? Or perhaps an express hydro massage if you need a massage but don't have the time for a full spa session. Perhaps you need to leave the kids with a Sun Peaks Babysitter (see contact form below)? Would it help having select alcohol or groceries delivered right to your Sun Peaks vacation rental? Speaking of rentals - best Sun Peaks equipment rentals? How about having a catered, delicious, gourmet meals with the finest of ingredients carefully prepared and delivered hot to your rental unit or prepared in your unit while you socialize with friends or family? Looking for somewhere to host a large family or group event? A reunion, celebration, banquet or even a Sun Peaks Wedding? We would love to help - just ask! Weddings at Sun Peaks are very special and are becoming popular activities here - whether in the square, by the bridge, in a beautiful hall or even heading up the chair lift in winter or summer. Horse drawn carriage or sleigh ride - sure - we can help! Special Sun Peaks services can also include private sports lessons, private tours, or even a local, professional photographer. Wedding photographers, sporting event/action photographers, family memory specialists - experienced and professional Sun Peaks photographers are ready to capture the special moments for you. What Sun Peaks Services can we help you with? As always with non-bank cash machines, there are additional service fees for cash withdrawals, and one must always check the machine to ensure it doesn't look tampered with. 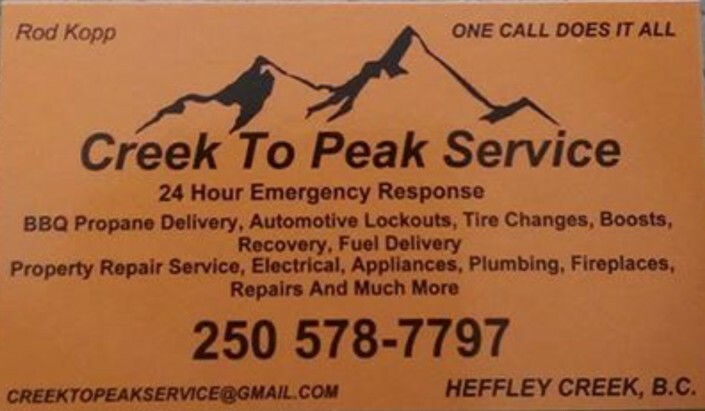 Creek to Peak Service - 24 hour emergency service to Sun Peaks for car lockout situations, battery boosts, auto recovery, tire changes and minor on the spot repairs whenever possible. Motorcycle repairs can also be done at their home service and repair shop, located just minutes away from Sun Peaks Resort. Sun Peaks Babysitter – we are working with the manager of the Sundance Daycare at Sun Peaks to maintain a list of trained babysitters for guests coming to Sun Peaks for their vacation or special events. Simply complete and submit the form below to have the Manager or one of the babysitters contact you. You will then be able to interact directly with them to determine if there is a fit for you and your child or children. In addition, the Sundance Daycare at Sun Peaks is now open most days year-round, 8:00 am to 5:00 pm, subject to having enough children registered for the day. Please register in advance by contacting the Sun Peaks Daycare using the Babysitter form below. 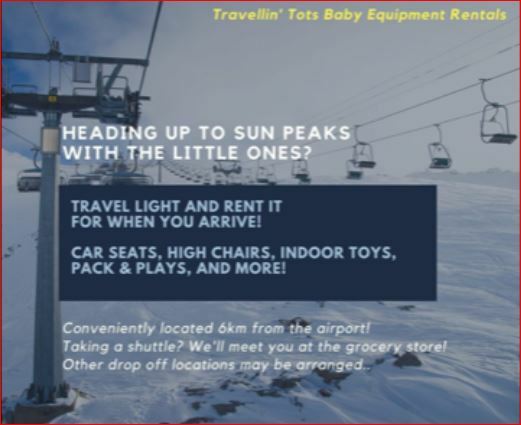 Baby and Toddler Equipment Rentals from Travellintots - located in nearby Kamloops and offers a good selection of child carriers, strollers, car seats, cribs, playpens, play equipment and other items that parents may need to rent during your Best Sun Peaks Vacation. Delivery to Sun Peaks is now an option. Pickup/drop-off of rental equipment can also be arranged from the Kamloops airport or Sun Peaks Resort. BPH Services - Brian Heron is a trained, licensed and bonded locksmith at Sun Peaks performing many different Sun Peaks Services. He offers many other property management type services, including finish carpentry and repairs, renovating, cleaning and maintaining ski condos, townhomes and chalets, both rented and private. Creek to Peak Service - Sun Peaks residential services including: gas fireplace service, residential electrical, residential plumbing, construction repairs, painting and drywall, carpet cleaning, interior high window cleaning, interior high lighting bulb replacement, appliance repair and/or replacement, hot water tank service and replacement, barbeque propane tank exchange, and automotive services as listed above. In our view, the Best Sun Peaks Builder and a great guy! Peak Maintenance - Sun Peaks home handyman, property maintenance and home improvement services. David has over 30 years of experience and can do anything from installing a shelf to renovations, additions, upgrades, etc. Reliable, trustworthy, skilled and reasonable prices - many different Sun Peaks Services. Call David at (250) 318-8137 or email david@peakmaintenance.ca. Sun Peaks Resort is about 45 - 60 minutes from the airport and there are several options available for getting from Kamloops airport to the resort. - you can arrange your own car/truck/suv rental. Ensure it has proper tires for the conditions. 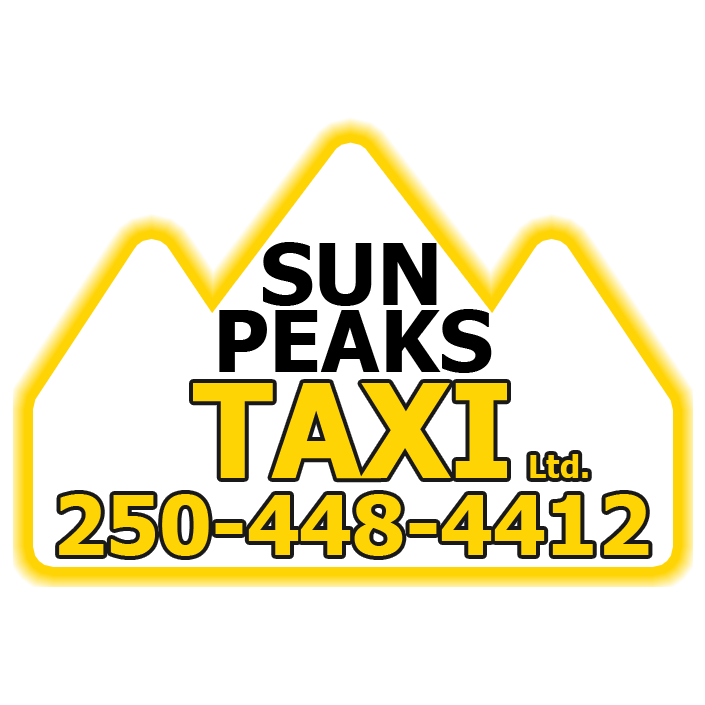 - a taxi from Kamloops will cost you around $150-160 - book in advance with Sun Peaks Taxi. - Sun Peaks has an arrangement for a Sun Peaks/Kamloops airport shuttle bus service. Summer prices are expensive - around $125/person. Winter prices are around $49/adults, less for children. 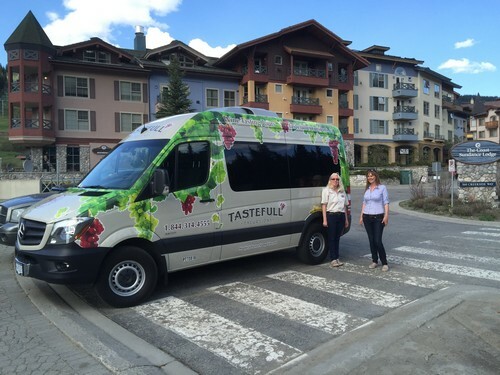 - One of our Sun Peaks winery tour operators also offers an all-season shuttle bus service. Current pricing at the time of writing is $48 incl gst per adult one way, booking return gets a 10% discount on the total. Complete the form below for pricing and availability. Black Tie Dining - Proudly serving Kamloops, Sun Peaks and the surrounding area, the chefs at Black Tie Catering are experienced, passionate chefs who primarily focus on small groups to ensure quality and satisfaction. Whether it be a business luncheon, cocktail party, staff gathering, family dinner or their specialty in-home dining experience, they are pleased to accommodate your culinary needs. Utilizing both local and intercontinental foods, they offer a creative, colorful and globally inspired style of cuisine. Bottoms Fine Dining Catering - top notch, 5 course meals prepared, delivered to your Sun Peaks accommodation by certified Red Seal, Professional Chefs from Bottoms Bar & Grill. Beautifully prepared and presented, delicious, and don't worry - no dishes! Custom menus available for high-end entertaining and Sun Peaks Services for catering while at Sun Peaks Resort. He offers many various other property management type services, including finish carpentry and repairs, renovating and maintaining private homes, both vacation rentals and private residences. Top of the Mountain - full service Sun Peaks property management, property marketing, cleaning, customer service and vacation rental options with excellent customer service and attention to detail. Creek to Peak Property Management & Cleaning Services - Family owned and operated by local residents who provide a full range of services including property management services, post guest departure and deep cleaning, linen cleaning and exchanges, supply replenishment, service provider walk-throughs, and general property maintenance and Sun Peaks services provider. For Winter, Spring, Summer and Fall equipment rentals at Sun Peaks Resort, see our Sun Peaks Equipment Rentals page, including skis, snowshoes, bikes, kayaks, canoes, stand-up paddleboards and more. Discounts are also available on Sun Peaks equipment and lift pass packages. - Visit our Sun Peaks Groceries and Liquor Stores page for local and nearby stores and Sun Peaks grocery delivery options. 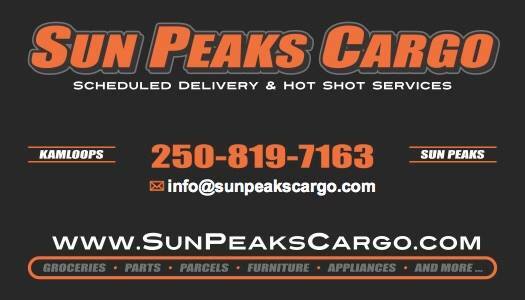 - Sun Peaks Cargo picks up & delivers packages, furniture, appliances, luggage, ski equipment, groceries and more between Kamloops and Sun Peaks on a regular service. Additional weekend deliveries can be arranged. Style For Everyone - The only private, professional, hair salon in Sun Peaks Village, specializing in men's, ladies' and children's hair cuts, colours, waxing and formal preparation. Style For Everyone is owned and operated by Heidi MacGowan who has been practicing the art of hairdressing since 2005. Her studio is located in beautiful Sun Peaks, where she provides professional services at a reasonable cost. The new Sun Peaks Health Centre opened in time for the 2017/18 ski season and finally has a full-time doctor and offers a family practice with regular appointments as well as advanced access appointments for sudden illnesses and visitors. It is located at 3115 Creekside Way, near the P2 parking area and next to the Annex (formerly Bentos). The hours at the time of writing this are 10:00am-4:30pm Monday to Friday and some weekends 1pm - 5pm for winter. 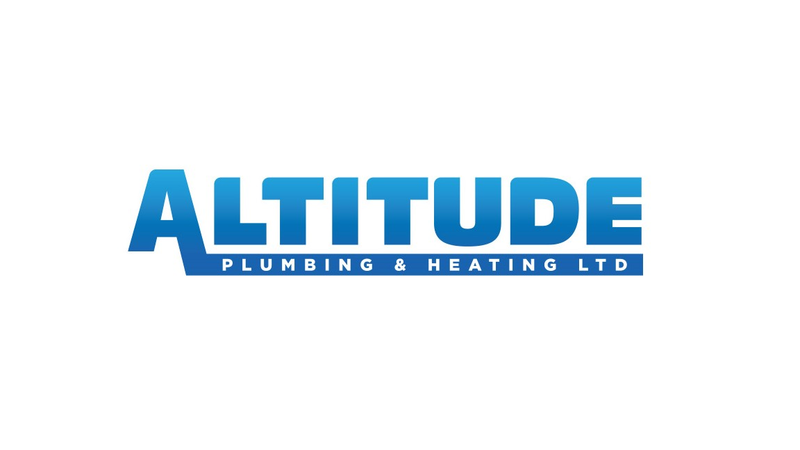 Hours do vary so it is best to check their website or call first. Visit the Sun Peaks Health Centre website for more information, and the Sun Peaks Family Practice phone number is 778-644-0635 - call to confirm availability. Another option is the Sun Peaks Spa as well as other Sun Peaks RMT's and Sun Peaks mobile massage options. Keep in mind - donations are always appreciated to help grow this Centre! Sun Peaks Aquatics - Sun Peaks services for hot tub sales, service & repairs, installation, daily maintenance, and other water related services. Highly recommended! Sun Peaks Resort is very pet-friendly, with pet-friendly hotels, pet-friendly accommodation, and pet-friendly hiking, biking and Nordic ski trails. But for those who want their pet to have a holiday too, there is not a Sun Peaks kennel directly in the village. There is however a kennel on the way up the hill that comes highly recommended by our guests - Sun Peaks Kennels. Sun Peaks Spa - wonderful facility and lovely, professionally trained, friendly staff for many types of massage, manicure, pedicure and facial services. Solo or couples, male or female technicians, RMT's, and many other skilled services. Sun Peaks Mobile Massage Services for Deep tissue, couples, relaxation, therapeutic, sport, or just plain fun and rejuvenation massages right in your Sun Peaks accommodation. Everything you need is brought right to you. Sun Peaks Mobile Sports Massage (RMT) Services - same as above but a little more expensive since you are working with a certified Registered Massage Therapist who can issue a receipt for taxes/healthcare plans. 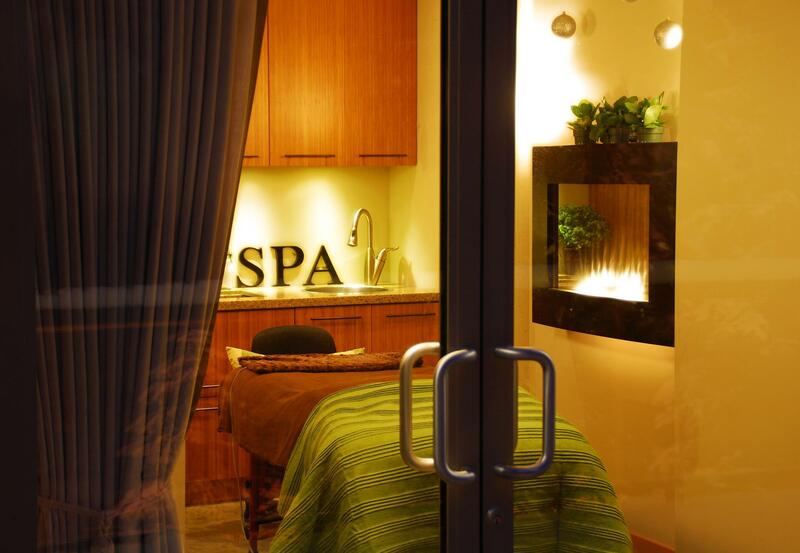 Sun Peaks Spa Express for fast but effective hydro massages, facials, manicures and pedicures. Laigne Dagneau - Invite a professional hairstylist and makeup artist of over 8 years into your Sun Peaks suite for a one-on-one or group makeover event. Laine will upgrade your day-to-day routine or create a smokey night-out look, and leave you with the new tips and tricks for shortcut ways to have flawless hair and makeup from day to night. Down The Road Wellness - located just a 10 minute drive from Sun Peaks, Down the Road offers Registered Massage Therapist services, mobile and hot stone massage, yoga, stretching and posture training, and other general wellness services. Kelly Funk Photography - a Kamloops-based photographer, specializing in commercial, tourism, stock and portrait/head shot photography. He is heavily involved in the promotion of destinations, businesses and corporations in the Kamloops and Thompson Okanagan region of British Columbia, and throughout Western Canada and works closely with the likes of Sun Peaks Resort, Destination BC and Tourism Valemount. His many images of the Thompson Okanagan showcase the beauty and diversity of the region and are widely used for promotional purposes. On a National level, Kelly is the Photo Editor and regular columnist for Outdoor Photography Canada Magazine, Canada’s only outdoor photography publication. Nancy Critchley Photography - honoured to have opportunities to create and preserve lasting memories for so many people through her art. Located in Hay Lakes, Alberta but has a 2nd home and spends lots of time in Sun Peaks. Rozalind Ewashina - popular Kamloops-based artistic photographer specializing in wedding, anniversary, headshot, personal and boudoir photography. Silver Moose Customs - Sun Peaks area seamstress with full custom studio. Specializing in sewing / alterations/ repairs for clothes and snow gear.. even lengthening ski pants! Hemming, custom memory quilts, stockings and various other items, including leather. Pickup and delivery available free of charge in the Sun Peaks area. Finally! Effective October 2018, there is a Sun Peaks Taxi Service operating on the hill. Operations will begin with two taxis (one year-round and a second October through April) and they will operate on the hill and to/from Kamloops, the airport and even throughout all of British Columbia for special pick-ups and drop-offs. Style For Everyone - Heidi MacGowan of Sun Peak's Style for Everyone will come to where you are staying at Sun Peaks and provide stress-free hair services for the bride and the wedding party.